This trip has been such an amazing experience. 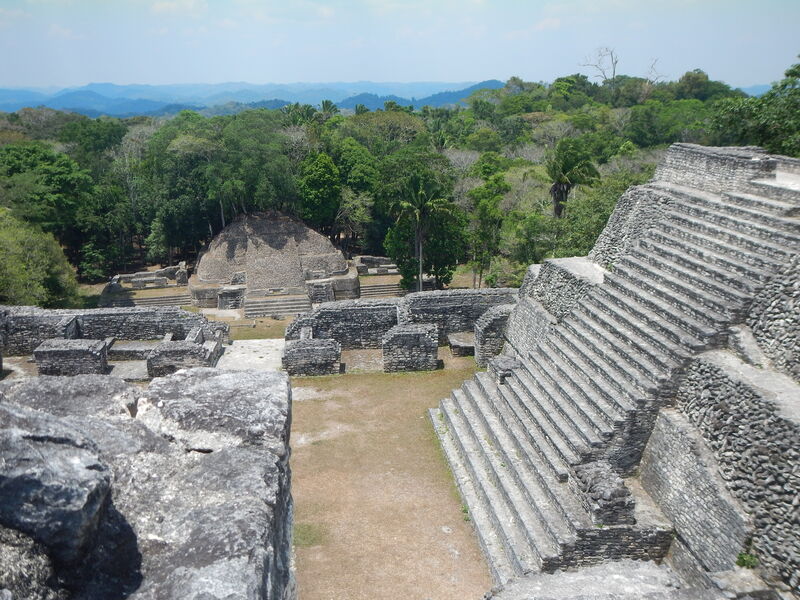 I registered for the EBIO 319 hoping about tropical ecosystems, conducting experiments in the field, and the country of Belize. This course far exceeded my expectations. I also learned about travel, troubleshooting, and how to feed yourself when Houston runs out of water, which I wasn’t anticipating but will surely come in handy in the future. More than that however, this trip has completely reaffirmed that I need to find a job that involves fieldwork. It’s difficult to explain, but I feel so complete hiking through the rainforest, surrounded by the buzz of countless birds, insects, and the occasional monkey, miles from human settlement. If I wasn’t flying back to the jungle tomorrow I think it would have been a bit of a culture shock to return to “normal” life. I learned so much from the lectures and projects we worked on, but I also enjoyed the unstructured time where we were free to explore the amazing ecosystems around us. My favorite parts of the trip were 5 am walks through the jungle, kayaking through the mangroves, and late nights watching stars dart across the sky. My least favorite part was probably the pre-trip assignments, but I definitely see how helpful this preparation was in the field. At first glance, the reef and the rainforest are vastly different ecosystems. There is almost no overlap between species, and the organisms have very different adaptations to their respective environments. However, I was amazed to see how much they had in common. Both ecosystems are incredibly diverse, in terms of species and microhabitats. Interestingly, while both ecosystems are full of life they are also very nutrient-poor and cycle nutrients very efficiently. Trees and coral colonies provide 3-dimensional structural diversity, and very different species reside in different layers of the forest and reef. When we went on night hikes and dives both ecosystems were nearly unrecognizable, and a completely different set of species revealed themselves. In addition, I thought it was interesting how both sites managed their resources. Although Glover’s and Las Cuevas were situated in protected zones, both allowed selective removal of species. The US is a large and wealthy country, so we can afford to set aside large swaths of completely protected land in national parks. 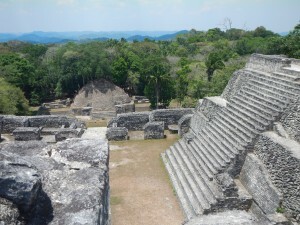 From an American perspective, it would be awesome if Belize could similarly isolate the Chiquibul. However, this forest covers 1/7 of the entire country, so it would be very difficult to isolate the forest without economic repercussions for the country. Despite this removal of species, both areas are relatively pristine in comparison to their neighboring countries. Consequently, both struggle with people coming across the border to harvest resources—xaté palm in the chiquibul and illegal fishing in the attol. This also poses a difficult problem for the country. While they certainly want to secure their borders and protect their resources, arresting offenders will likely only worsen the problem. Most of these people are the primary providers for their families, and turning them away or arresting them could mean the starvation of their children. I could go on for pages about everything I learned on this trip, but a few ideas really stood out to me. Conservation is an incredibly complicated problem, and we can’t barge into other countries with a single solution that will fix everything. A multitude of complex circumstances lead to the degradation of ecosystems, and many creative solutions will be needed to reverse or even slow ecosystem loss. I’ve wanted to do field research for many years, but before this trip I wasn’t quite sure what that would actually look like. Now, I can see how many of our pilot experiments could be expanded into long-term studies. Finally, this trip has definitely reaffirmed that I’m on the right path for my life. While my dreams for the future may change, I can’t imagine a life that doesn’t involve exploring nature, in whatever form that may take. Korea has a blessed geography where the mountains that consist 70% of the country are covered with deciduous forests of green, orange, and white that parade through the year. I am used to the changing hues of the forest as I watched them from my house in Seoul, lived within them in the barracks, and experienced them inside the forests whenever I hiked them. Indeed, the nature I am local to is undoubtedly beautiful. However constant human coexistence, modern extraction and exploitation have made the ecosystem devoid of much diversity. Naturally the immense biodiversity I witnessed in the rainforest and the coral reef past two weeks have overwhelmed me with the manifestation of untamed, uncontainable vigor of life in its true form I never have experienced. As the common prefix eco- (oikos, “house” in Greek) imply, ecology and economy share similar principles based on deliberate will for persistence and elevation. They exhibit similar analogous features that I wish to refer an economy as an ecosystem. Dependence to “capital” is one of the features. The size and vigor of an ecosystem are relative to the amount of available capital. Just as an economy grow in size and diversity with input of capital (be it foreign or domestic), biodiversity and biomass will increase as more energy and nutrient is present. Sunlight is the prime source of energy for all life. The immense biodiversity along the equator is not surprising with the blazing amount of sunlight that hit the tropical rainforest, as evident with my sunburnt skin. The high canopies of the rainforest and vast field of corals and algae pumps the ecosystem they support with energy they converted from the sunlight with amount unmatched by any other biome on Earth. Another characteristic of a healthy and sizable economy is the rapid circulation of money. At least in theory with lots of money in the economy, people will consume more, loan more, and produce more. However, rainforest soil and the tropical ocean lack nutrient, paradoxically to the great biodiversity and abundance they hold. But think: these ecosystems are full of consumers that will extract nutrient from the environment and another. Once a tree dies or a leaf falls, or a fish dies, they will rapidly turn back into nutrient by decomposers and as much rapidly be consumed by the great number of other consumers. With great amount of source of nutrients and equally great amount of consumers, nutrients have no time to be accumulated into the soil or water. With great availability of capital, its healthy circulation, economy diversifies, creating various niche meeting the various needs of people. Ecosystem show similar trend. As the trees create diverse canopy structures, and as reefs create complex formations, organisms that depend on them will radiate accordingly, specify, and speciate. The specific symbiosis like Azteca ant: cecropia tree, Pseudomyrmex ants: acacia trees, and Atta ants: fungus farm demonstrate such specificity. 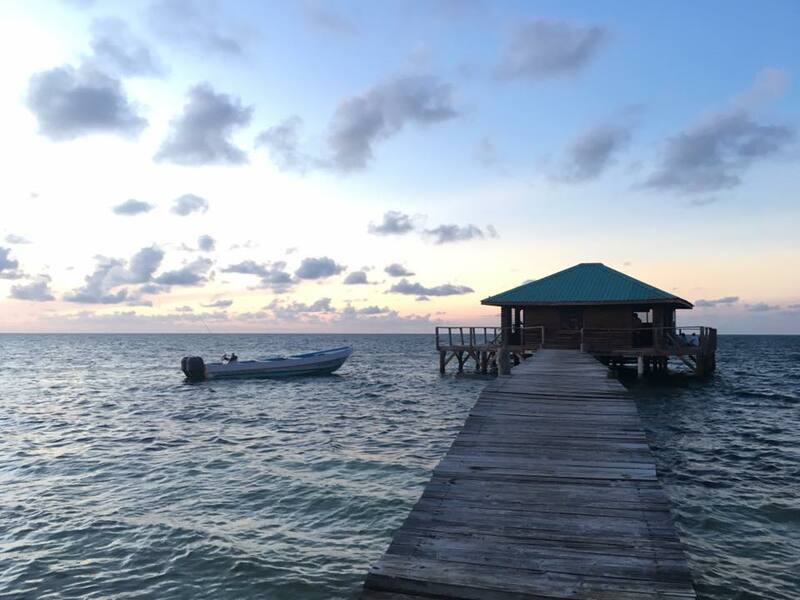 While rainforest and coral reef ecosystems share principles to most richness and diversity, each received myself with different level of hospitality. In the forest I was part of it. I experienced the soil, the tree, air, ticks, the point of view like the other inhabitants. Without deliberate intention as that of blood sucking ticks or mosquitoes, fellow inhabitants of the forest never approached us. Subtle signs like the howler’s monkeys’ call and disturbed forest floor indicating the jaguar’s presence implied their existence. These forest animals really respected personal space. However, I was only a guest underwater. Animals recognized my presence and fled or showed aggression only when I approached them so closely. The fragile nature of the coral reef ecosystem was striking. The visible competition between the coral reef and algae for space and sunlight highlighted the intricate nature of the corals and how special this ecosystem is. The rising sea temperature, defiling marine debris, flow of excessive amount of nutrient into the waters, all are collaboration of humanity to destroy this important ecosystem where we cannot pinpoint our judging fingers to. Through this course I successfully realize what I like and what I can do regarding field biology which will consist significant part of my career. As I spent more time among the rainforest I learned how much I liked the place. 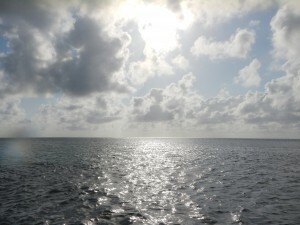 My initial expectation was that I will like the diving and the open ocean horizon of the atoll. But the dry and pure breeze and thick canopy that shaded me from the blazing sun convinced me that rainforest is not bad at all. I should wait until I experience the rainy season and the bloom of mosquitoes but I did like the forest’s dry season. Meanwhile, I truly learned the terror of sandflies at the atoll. These small devils made unpleasant hickey marks all over my body followed by extreme itchness. I just couldn’t bear it. Also without shade, I was in direct exposure to the sunlight. Contrary to the expectations I realized myself as a “Turf” person. I love the mountains and the forest as I am more familiar to them. The academic part of the course was far beyond my expectations. I really liked how each projects challenged us to ask the right question, make a right hypothesis, right methods, and right conclusion from the unexpected results. I learned how much I must learn and be trained to make relevant decisions regarding a research. As for the unexpected results, I will never forget when our camera trap caught a wild ocelot. The beautiful pattern of the small leopard embodied the beauty of unexpectedness gift of the nature. The immense biodiversity that I encountered in the rainforest and coral reefs embodies the radiant will of life that seeks to rise. And this will is the will of genetic materials to proliferate. The characteristics of each species I saw came to be either as an effort to sustain itself under pressure or to expand and exploit under favorable conditions. Witnessing this principle, I accepted that the purpose of life to rise naturally reside in our species still. However, struggle to rise does not necessarily involve unjustly exploiting on others. Yes, we have to prey on others like all life does but there is an extent to which the extraction will become unnatural exploitation. Humanity has long exceeded that threshold. After this course I once again recalibrated, reinforced my will to contribute to the effort to correct humanity’s current path down to unnatural decadence back to that of natural and healthy will to sustainable power. This trip was one of the most amazing experiences of my life. Not only did I learn a ton, but I also discovered how fun and rewarding field biology can be. In visiting both the tropical rainforests and coral reefs of Belize, we were able to experience the two most biologically diverse ecosystems on the planet. Though at first glance these ecosystems may seem very different, they actually share many characteristics that may contribute to their amazing biodiversity. 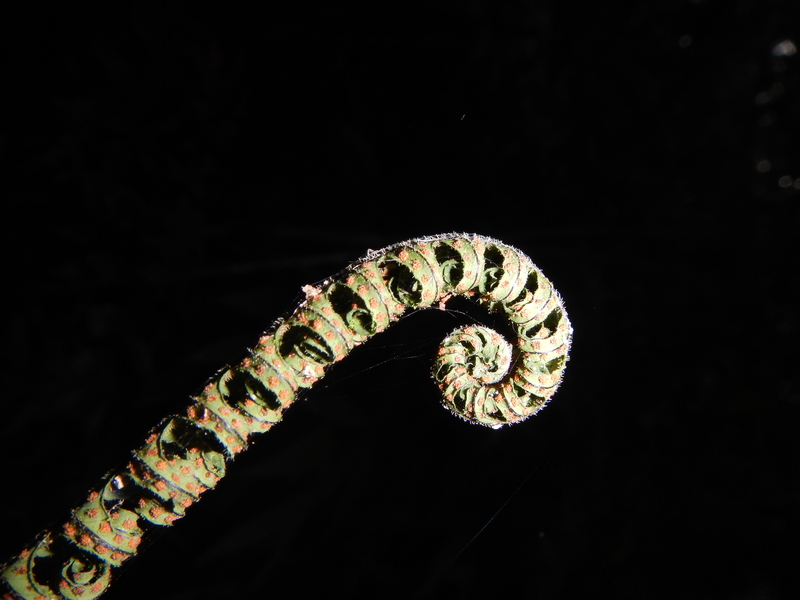 Both tend to exist in the tropics (as seen by the existence of both in Belize), where stable temperatures, large amounts of sunlight, and/or long evolutionary lineages may contribute to extreme biodiversity. Additionally, both rainforests and coral reefs often exist in nutrient-poor environments, and thus nutrients are cycled through the communities rather efficiently. The rainforest and coral reefs had incredible structural diversity. In general, the rainforest’s structure was provided mostly by plants, while the reef’s was provided mostly by coral colonies. With so much structural diversity comes the creation of a plethora of niches for species to inhabit, thus allowing for many species to exist in the same ecosystem. In both areas, we saw countless species from many different taxa, some of which seemed similar but in reality had slightly different ecological roles. 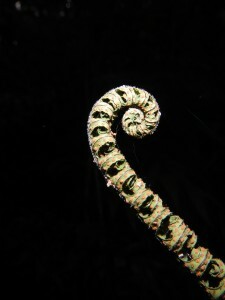 The species compositions of the rainforest and coral reefs were of course very unique. For example, very few mammal species exist in the Belizean reef environments, but a large diversity of mammals exists in the Chiquibul forest. One specific similarity that I noticed between the rainforest and reefs was the complexity of their trophic pyramids. For example, on a coral reef, a great barracuda could eat a Nassau grouper, who could eat a bluestriped grunt, who could eat a clam, who may filter feed on plankton. This complexity is very interesting, and as the “expert” on mammals and piscivorous fish, I found it really exciting to be able to observe some top predators in the wild. The only thing that this course did not provide me with was a sighting of a wild jaguar (which only means I need to go back!). It really was everything I could have hoped for. There was more scientific methodology practice than I had expected, but I think this was very helpful for learning about how science works in the field. My favorite part of EBIO 319 was just being able to explore the rainforest ecosystem, whether through early morning walks or camera trap images. My least favorite part was probably the pre-trip preparation (which was a bit stressful), but I think it all paid off in the end. 1) Living in a more sustainable way, by focusing on true needs (like hydrate or die) rather than superfluous wants, is incredibly rewarding and strengthening. 2) Seeing an elusive creature (such as a tayra) in the wild, even if it took hours or days of seeing nothing, is absolutely worth the effort. 3) Even with little sleep, few snacks, no internet, cold showers, limited electricity, and lots of ticks, field work felt rejuvenating! 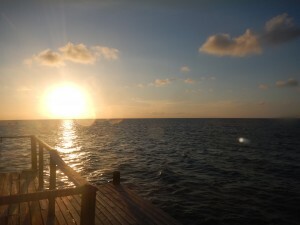 Overall, a completely unbelizeable experience! Today was officially our last day in Belize. I didn’t want to leave that beautiful country, with its pristine natural places and amazing people. I plan to return one day soon! Even though it was our last day, we still had work to do! We left Glover’s at 7am with a packed breakfast, and headed out to Carrie Bow Caye. This island is only an acre in size, but houses the Smithsonian research station. The volunteer station managers gave us a nice tour, and we got to meet some of the researchers doing work there. The station seemed like a really nice place to do field work. 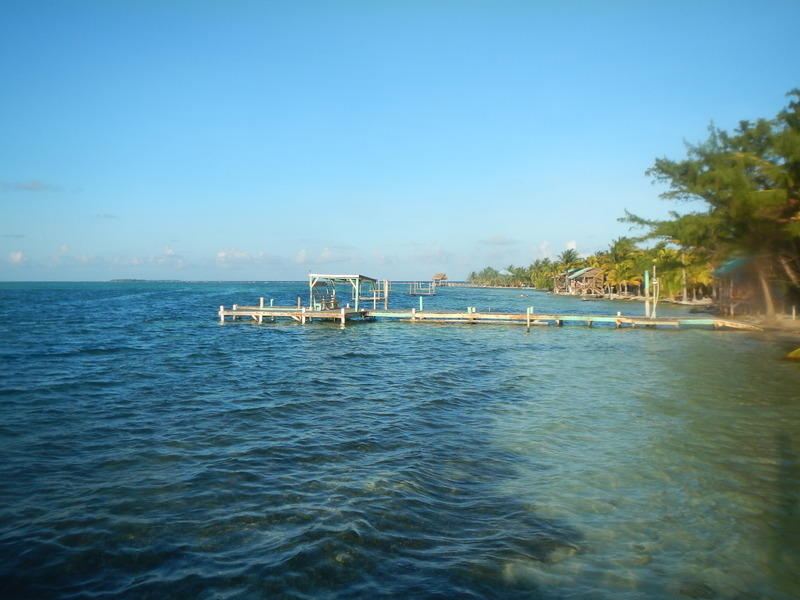 After Carrie Bow Caye, we travelled to Twin Caye, an island separated by a narrow channel. Here, we got to explore the infamous mangroves. Luckily, there were almost no mosquitos or sand flies. The mangroves are an incredible environment both above and below the water. The mangrove tree species have evolved special adaptations, such as aerial roots, to deal with the high salinity of their environment. Underwater, the trees often have mutualistic sponges attached to their roots. We saw many species of juvenile fish swimming throughout the tangled root systems, as mangroves often serve as fish nurseries. I saw a small school of juvenile needlefish in the mangroves, and other students reported seeing a barracuda as well. Since so many fish species start their lives in mangroves, it is paramount that these ecosystems are preserved. After getting back to Belize City around noon, we had another lunch at Calypso restaurant, and then said goodbye to all the Glover’s staff that had been so helpful to us throughout the trip. Then it was off to the airport, and back to Houston (thankfully, no transportation troubles this time). It would be impossible to write down even a percentage of the things I learned on this trip, but I will attempt to do it justice in the small amount of space I have here. The most important thing I learned was how to stay positive and roll with the punches even when nothing is going according to plan. I also learned the importance of keeping your relationships strong with those in the field. There were so many times when we relied very heavily on people that Adrienne and Scott had worked with many many years in a row, and they were the people who helped us out the most when things went wrong. I also learned how integral it is for everyone to be involved in conservation, not just those that spend their lives on it. No one organization can do everything, and often conservation is the most powerful when whole countries or groups of people get invested. 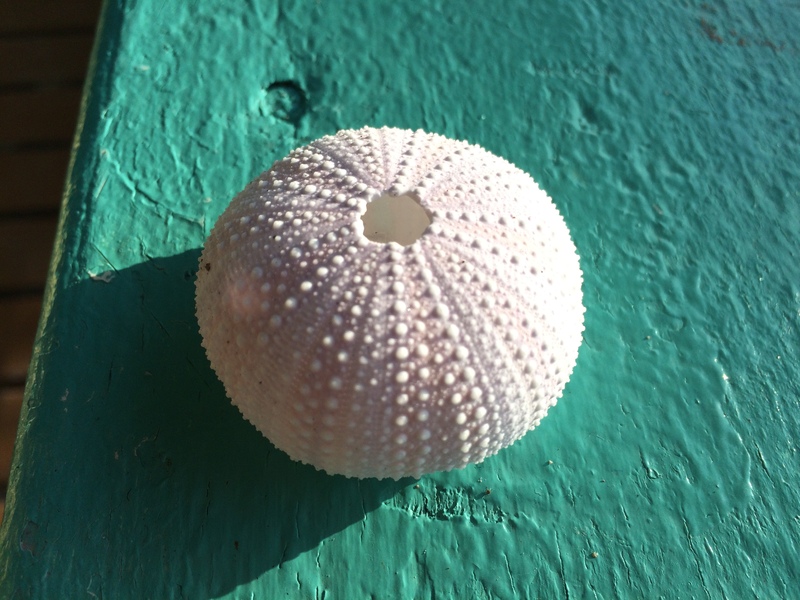 I also learned tons of skills like how to string a quadrat, how to snorkel while not kicking the corals around you, how to create pitfall traps etc., but I won’t go into the nitty gritty details of all that. I think most importantly, I learned about how similar the coral reefs and rainforests really are. Not only are coral reefs and rainforests facing similar threats in the forms of human development and changing global temperatures, but also they are both highly diverse ecosystems that support some incredible life that is important for people all over the world. The rainforests and coral reefs are very nutrient poor environments, and the organisms that break down dead, dying, or lysed material have to be efficient in order to the other organisms to be able to use those recycled nutrients. This cycling is how both environments maintain such high diversity in such nutrient poor environments. Furthermore, both environments deal with medium levels of disturbance regularly in the form of large storms, other natural disasters, and human activity. This disturbance ensures that no one species is able to dominate the ecosystem, which helps maintain the high levels of diversity we see in both the rainforest and the coral reef. Some of the physical similarities I was able to see was the presence of dominant large species that help build homes for smaller species. In the rainforest there are dominant tree species and then smaller trees or vines that take advantage of those species. On the reef the dominant reef builders are in the form of stony corals which provide homes for fish, worms, endolithic borers. They also end up being the framework for a lot of other corals or once they die they are colonized by macro algae, fungus and/or other corals. This course surpassed my expectations in a lot of ways. I was expecting to learn some field techniques, have some fun along the way, and get a little dirty. In all aspects I was surprised. I not only learned field techniques, but also how to deal with what to do when things go wrong in the field. I had more fun in this class than I have had in any class ever, and the people I got to meet along the way made it that much better. Also, I definitely got dirty. If you forced me to pick a favorite part of the trip, it would be the day we went out into the ocean to the fore reef and got to see the wave action, all the different species of coral, and the large fish and rays out there. I think as far as least favorites go I wish I had brought more cortizone cream and new how to deal with rashes better, although the blisters were also pretty bad. Now that I’m done with this class, I’m going to need to find something to fill my days. So if anyone is looking for 13 mile hikes in Houston, hmu. The rainforest and the coral reef ecosystems are so different yet so similar. For example both ecosystems are actually relatively low nutrient environments, yet both foster mind boggling biodiversity. All the primary producers are geared to maximize the limited amount of nutrients they have access to. The cecropia trees in the forest grow thin and tall to get through the canopy. The corals in deeper waters grow flat and wide to get as much of what little sun reaches through the abyss. One of the differences I noticed is that in the forest the primary produces are very abundant and in your face, it takes a little more effort and attention to detail to notice all the things it supports. Whereas in the water the primary produces are less apparent. It takes some careful spotting to sea the macro-algae growing on the sea floor, and you can’t even see the micro-algae that contributes so much to bringing nutrients into the system. But it’s very easy to spot the extremely wide variety of animals supported by these microscopic plankton. This is actually quite different to what I was expecting. I thought I would have see more animal life in the forest, but I felt like I saw more animals in the water. Mainly because sea creatures seem a lot less shy and let you get a lot closer before they skitter away. My favourite part of the course on land was the the bird watching. It’s a little surreal to wake up before the birds and sun. I feel like birds are the fish of the air. They can go anywhere they want. They seem so free, I’m jealous. The best part of the reef portion was the snorkel at the fore reef. I finally got better at diving, it’s so fun to go down and look at the coral and try to chase the fish around. That spotted eagle ray was insane as well. My least favourite part of the course it that everything else I do in life will seem bland and pale in comparison to these past two weeks. Thanks Scott and Adrienne for ruining the rest of life for me (totally kidding). I honestly loved everything about this. Even the tick and sea flies, it wouldn’t be real without them. I think the biggest take away for me is that these ecosystems are fragile and needs us protect them from ourselves. And it not just help from biologist or conservationists. Everyone can and should play a part. You don’t have to biologist to be more careful with your trash. You can be a geologist and still help run research stations. You can be an engineer and improve the infrastructure and equipment to aid biologist. I hope I can remember this lesson for the rest of my life and keep playing my part. Day 15: Who is Carrie Bow? Last day of the trip. I don’t want to leave, there’s a lump in my throat. We got packed breakfast because we were leaving Middle Caye at 7. I ate mine immediately. 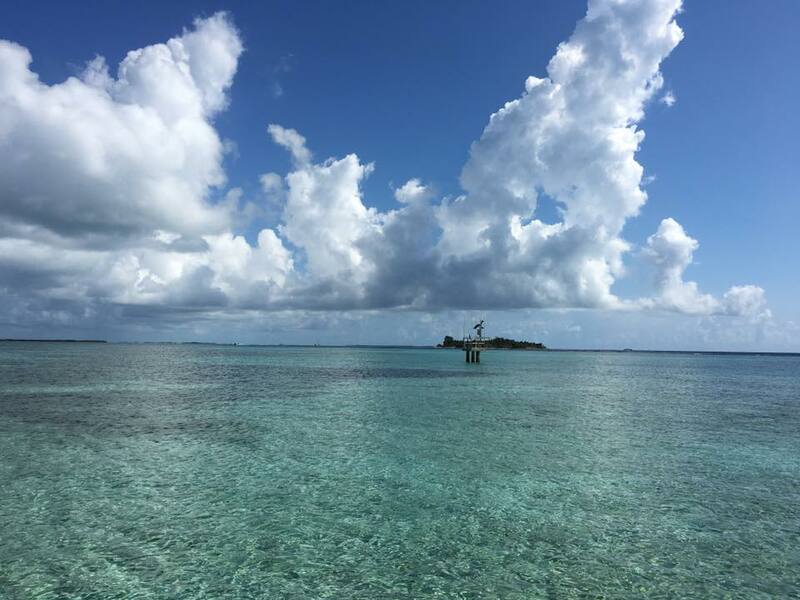 The first thing we did was take the boat to another island called Carrie Bow Caye. On it was another research station. The island itself was smaller than ours but their facilities are more geared towards research. It was run by the Smithsonian Institute. The stations managers Clyde and Liz took us on a quick tour. I learned that you can volunteer to be a station manager for 4 weeks at a time. Maybe I can come back here as a volunteer. Who knows. But I sure hope so. 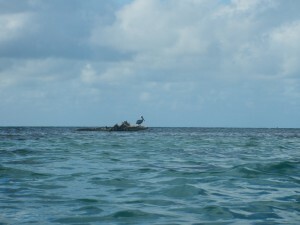 After the tour we went to another set of islands called Twin Cayes. The two mangrove islands was separated by a channel. We snorkeled up and down it to look at what was hiding in the mangroves. I saw a couple sea stars and some ginormous feather duster worms, but that was about it. I didn’t get to see a Mangrove crab in its natural habitat. Other people said they saw a barracuda. Getting out of the water for the last time sucked. We got back into the boat and we were off. Back to Belize City, then back to Houston. “This land is unbelizeable, you gotta see it to belize it.” I hope I’ll see it again. The morning was a busy one, summarizing the two weeks trip with undoing all the luggage and reorganizing them according to the last day’s plan. All the cloths I have wore bore the memories of the parts of forests and reefs I have seen with. I couldn’t believe a chapter of my life is coming to an end. We set out into the ocean early in the morning. 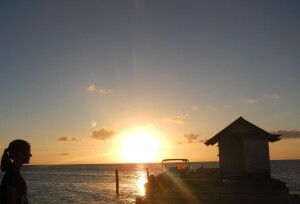 We stopped at Carrie Bow Caye where the Smithsonian Institute Research Station was situated. There on a 1.5 acre island stood cozy station where we heard about a retiring ecologist’s story. After that we continued on to our last ecosystem: Mangrove. The mangrove is a peculiar place where plants have engineered islands on sea water. It would have probably a small patch of island where mangroves started to grow. However as their high roots caught silts and their literfall accumulated, they expanded the island and host a immense biomass. School of juvenile fish swam among the eerie roots covered with sponges. I tried to look for brown algae but the mucky water made it hard. I couldn’t find one. 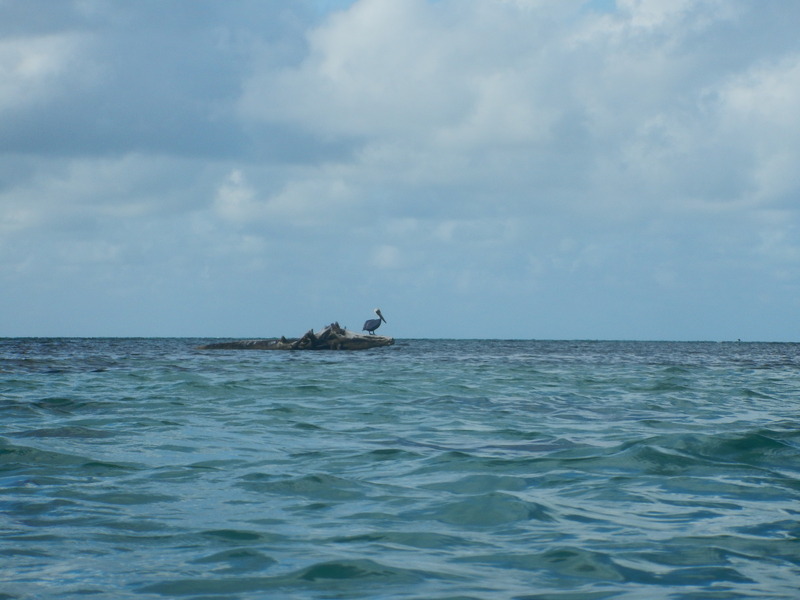 On the way to Belize City, we passed by a small island dominated by some trees and flock of frigate birds. Someone explained that it was their nesting ground that shrunk year after year because of rising sea level and hurricanes. The island was a fortress with small threats. More so the fate of the island made me sad.